As a regular Brno citizen I don't use to go to see annual Prygl fireworks [there use to be a lot of people, uncomfortable transportation to the Prygl and back and of course it is raining every year]. I prefer to admire the fireworks in pictures rather. 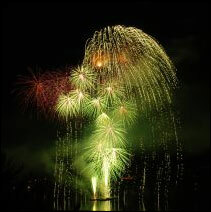 Nevertheless in the case of these Japanese fireworks I should have go to see them.